For this March’s Textile Forum (15-16 March 2017, One Marylebone, London), there will be an even greater choice of embellished and textured fabrics for designers looking to be inspired. “Fabric designers have produced some of the most elaborate ranges we have seen at Textile Forum since the show was launched in 2002,” says co founder and organiser Linda Laderman. “Suppliers have moved up a gear when it comes to creativity in texture, pattern and colour and are keen to introduce British quirkiness in design and artisanal techniques, to provide exciting collections to tempt fabric buyers. At Bella Tela the Koh-i-Nor diamond and the regal florals found within the British monarchy regalia have provided the inspiration for its spring/summer 18 collection. Called Ethereal, it features 100 new designs and has used traditional artisan techniques mixed with delicate laser and intricate embroidery, with colours inspired by the fragmentation of light that occurs through the stone, so includes tones found between colours of blush, rose and coral as well as a new faint heron grey and subtle golden tones. James Hare is responding to the return of colour in bridalwear with two new pastels – spring rose and blue prism – introduced into its chantilly lace group and a rose to co ordinate with its crepe backed satin and chiffon palette. Lace continues to be strong with a new guipure featuring an intricately patterned, yet elegant, for a traditional style gown with a modern twist, available in black or white. Michael’s Bridal Fabrics, which has also extended its range of laser cuts with 3D effects, has a guipure with laser cut panels and another with embroidery and beading. It has also introduced its first print designs, including one on silk organza and will also have some new Italian jacquards. As more brides now realize that the back of their dress is as important as the front, Michael’s Bridal Fabrics is offering a back panel design with a crystalled/beaded motif on each shoulder area, which is linked together by several layers of looped crystal or clear beaded bands. Best known for its plain, Pongees has recognised the importance for prints in spring 2018 and has pulled together a wide range of plain silks that are prepared for digital printing. 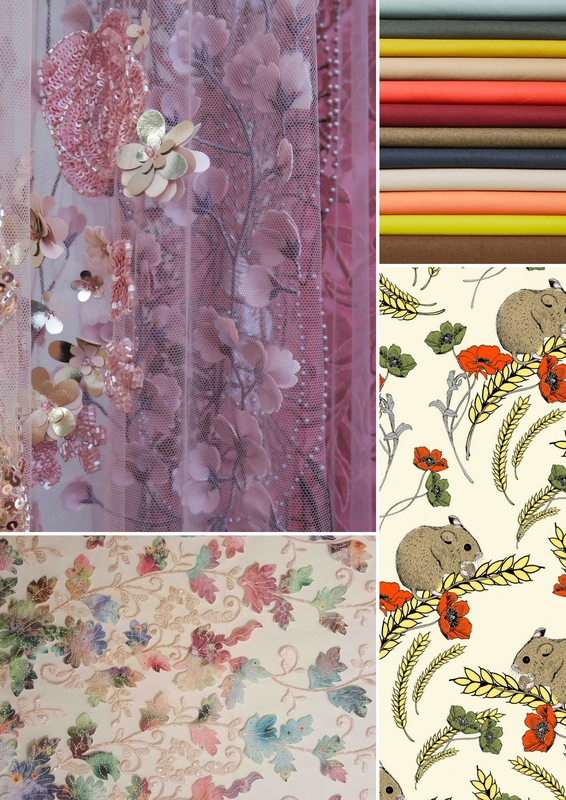 These include crepe satins, double crepes, crepe de chines, chiffons, georgettes and habotais, twills and jerseys. It is advising designers looking to create 3D effects to use layers of crisp organza ruffles and frills that can work alongside crumpled and rumpled, surface detail lace for an easy and relaxed mood and has also introduced more fancy fabrics, including embroideries, laces and jacquards, into the collection. For menswear, shirtings specialist Ringhart Fabrics is again opting for Britishness with traditional Tattersall checks in updated shades, along with textured plain fabrics aimed at younger men looking for an investment piece. On the suitings side, Holland & Sherry continues with the celebrations of its 180th anniversary, with collections for both men and women. Imperiod Gold, one of its most exclusive fabrics, woven in England, combines luxurious Mongolian cashmere and pure worsted vicuna with a dusting of 22 carat gold. Its anniversary collection features jacketing and suiting fabrics woven from Super 180s 14.5 micron yarns in worsted and woollen spun qualities available in a range of glen checks, guarded windowpanes, gun clubs and grid checks in classic colours. A W Hainsworth, which provided the red fabric for the tunics of the British army at the battle of Waterloo, is introducing new colours based on its military heritage. A new media partner for Textile Forum is Savile Row Style, which puts the spotlight on bespoke clothes. It also covers other upmarket topics of interest to those who shop in the Row or aspire to, and concentrates upon quality and craftsmanship in the modern world.